June 1, 2015 / What Are Your Ingredients for Marketing Success? Good marketing is like a good recipe. There are various ingredients that are used to create a successful outcome. When considering creative services, think about the goal you are trying to achieve and then determine how you will get there. By following this philosophy, integrated marketing strategies that include branding, graphic design, public relations, and social media combine to produce truly attention-getting results. The Poached Pear Bistro and Cross & Orange are two great examples of New Jersey restaurants who understand the importance of strong branding and creative services, and invested in a cohesive campaign from the start. The results? Each restaurant has earned a strong following among Garden State epicureans. Most recently, both venues were included on Zagat’s 10 Hottest Restaurants on the Jersey Shore round-up. As clients of M studio, the teams at Poached Pear Bistro and Cross & Orange called on a variety of our services leading up to their grand openings. They understood that branding components, including logos, font families and color palettes, inform everything from website design to the look and feel of their menus, and create a cohesive experience for their customers. The responsive design and development of their easily navigated websites are perfect for restaurant-goers looking to make a reservation on-the-go, or link to their social media channels to keep up-to-date on specials and promotions. Our PR team generated anticipation for both restaurants’ grand openings by securing media coverage in outlets including NJ.com, The Asbury Park Press, New Jersey Monthly, 94.3 The Point and most recently Zagat. Strong imagery is imperative in the culinary world, which is why both restaurants participated in professional photography sessions to capture menu items and team members for use on their websites, social media and public relations efforts. 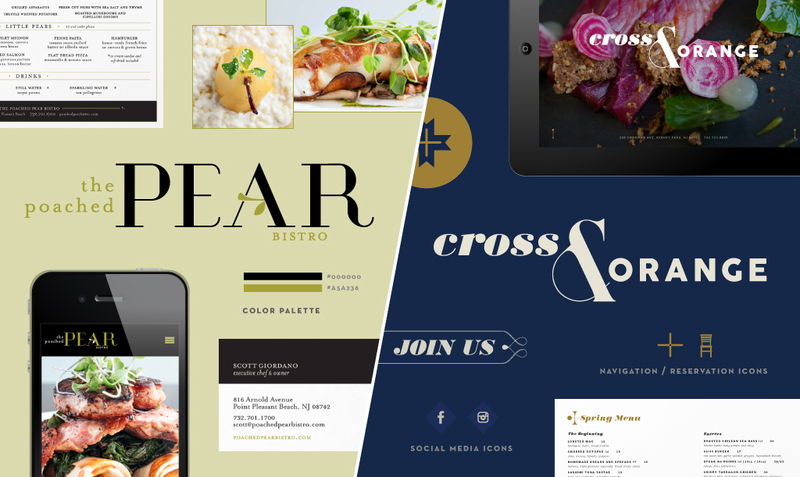 While the Poached Pear Bistro came to M studio with a name solidified, the team behind Cross & Orange was undecided about their name and identity when they contracted with our agency. By initiating the project with a Discovery Session, we were able to meet with company stakeholders and discuss their inspirations for the restaurant. From a SWOT analysis to the team collaborating on their vision statement, the origins of the Cross & Orange name, as well as the inspiration for their branding and messaging, were born in that first Discovery Session. With this service, M studio facilitated a strategic planning session that created a road map for our client’s success and informed all of the steps that needed to be taken leading up to Cross & Orange’s grand opening. Poached Pear Bistro and Cross & Orange each have a unique story and experience to offer patrons. One is a bar and restaurant inspired by the heritage and ambition of early America located in downtown Asbury Park, NJ. The other is a fine dining bistro in Point Pleasant Beach, NJ that presents familiar dishes in innovative ways. The restaurants’ individual narratives are communicated through branding and messaging systems that are unique to the venue and distinguish them from their competitors. It’s a wonderful thing when cohesive marketing and great food come together to create a truly memorable dining experience, don’t you think?